Burr’s health plan taxes employers – Where’s the outrage? 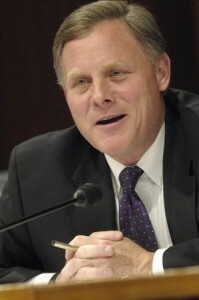 Senator Richard Burr recently took to WRAL to tout his new supposed “replacement” for the Affordable Care Act. Others have detailed the many flaws in Burr’s plan – like throwing the three million people already enrolled in private health plans under the ACA off their insurance and block granting our Medicaid programs – but I have a more fundamental question: Where is the outrage about the employer taxes in Burr’s plan on health plans offered to employees? Yes, that’s right, new taxes. In the Affordable Care Act, these new taxes were confined to “Cadillac plans” with generous health benefits and are seen as a primary way to reduce health care costs, but the Act still got raked over the coals by right wing opponents: “Obamacare ‘Cadillac Tax’ Causing Large Companies to Slash Health Benefits” screamed a typical headline last year. What employer plans will Burr tax? Not just Cadillac plans. Burr himself says “very few” plans – but that’s not what the bill says. Even friendly conservative commentators promoting Burr’s plan talk about over $1 billion in new employer taxes. The bottom line is that Burr’s plan has at the very least exactly the same – or, by friendly estimates – even more of a tax on employer health plans than the Affordable Care Act. So, where’s the conservative outrage on Burr’s new employer taxes? Where are the screaming headlines, the 24/7 Fox coverage of the horrors of the new taxes Burr wants to institute on businesses? Nowhere to be seen. Get beyond the usual double standard the conservative media apply in situations like this and you see what Burr’s plan for the vacuous political grandstanding it really is. But this political grandstanding comes with major new employer taxes – a big downside for any politician who hopes to use Burr’s plan as their “alternative” to the Affordable Care Act. What I am wondering is where is the usual Alan/ML troll comment directly after mine? I am disappointed. Dude, Admin you are getting a bit too happy pappy deleting my comments. I was actually agreeing with you guys here!